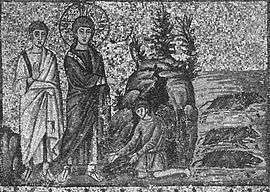 Fifth century mosaic of Christ exorcising demons, Basilica of Sant'Apollinare Nuovo, Ravenna, Italy. Jesus exorcising at sunset is one of the miracles of Jesus in the Gospels. It appears in the Gospels just after the Healing the mother of Peter's wife, namely in Matthew 8:16-17, Mark 1:32-34 and Luke 4:40-41. According to the Gospel of Luke, as the demons came out of many people, they shouted, "You are the Son of God!" But Jesus rebuked them and would not allow them to speak, because they knew he was the Christ. Sundown signified the end of the Sabbath. Many people came out or were brought out to Jesus to be healed of their infirmities and delivered from evil spirits. As described in the biblical account of the event, every single person that came out was healed or delivered. Jesus had compassion on the mass of people in his presence because he identified with the pain and suffering they were going through even though he wasn't subject to the afflictions himself. The supernatural power flowing out of Jesus provided evidence of him being the foretold Messiah of Israel as prophesied by the Isaiah the prophet. ↑ McArthur, Dr. John (1987). Matthew 8-15 MacArthur New Testament Commentary. The Moody Bible Institute of Chicago. pp. 17–19. ISBN 0-8024-0763-3.